View More In Lunch Boxes. Food Stays at Just the Right Temperature! Even when you're stuck at the office, hot chili or creamy soup can bring the comfort of home. them awkward to eat from, clean and fill with food. mouth makes it easy to fill up and eat from, so just grab a spoon and dig in! and dishwasher safe for a quick cleanup. Order Your Thermal Now and Bring the Comfort of Home Anywhere You Go! BOWL SHAPE: Insulated thermal food containers may keep meals hot, but their tall, narrow dimensions make lunchtime a little awkward. Our 16oz Thermal was specially designed to mimic a bowl shape, making it easy to eat from and convenient to fill! SUPERIOR INSULATION: We developed our triple-insulated Thermal technology to keep food at just the right temperature! Our insulated Thermal food containers stay cold for up to 12 hours or hot for over 6 hours. We're so confident in our 16oz Thermal that we guarantee it will outperform a product of the same capacity from any other brand. ALL STAINLESS STEEL INTERIOR: Enjoy a hot bowl of soup without your food touching plastic! The Thermal's interior, including the lid, is made of durable 18/8 stainless steel. Dishwasher safe for a no-hassle cleanup. HOLDS A FULL MEAL: At a convenient 2-cup size, the Thermal serves up a perfectly portioned serving of soup! Its 4.5" diameter is ideal for chunky stews or fruit salad, and it makes it easy to fill with your lunchtime favorites. 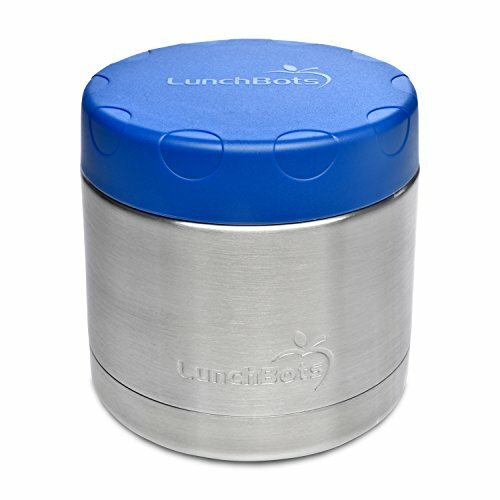 At 4.5" high, it goes great with the LunchBots Uno, Duo, Trio, Quad, Cinco and Pico containers and fits in our Duplex thermal lunch bag. LEAK PROOF DESIGN: When you have a hectic schedule, you need a food jar that can keep up! Completely leak proof, the Thermal is a must-have for grab-and-go mornings. You can drop it in your purse, briefcase or backpack without the worry of accidental spills or messes.